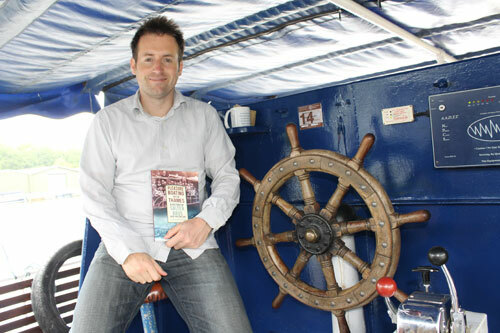 Salter Brothers which runs a boat trips from Henley in the summer from Mill Meadows is the subject of a new book ‘Pleasure Boating on the Thames: a History of Salter Bros 1858 – Present Day’ being published this week. The author, Simon Wenham first thought about writing the book when he got a summer job at the company in 1998 and discovered a treasure trove of family archives in the office. He then went on to use the material for his History Masters Degree and Doctoral thesis at the University of Oxford. When he started the project he didn’t realise how famous the family was and what an important role they played in popularising pleasure boating on the Thames. The business has been on the Thames since 1836 and the Oxford to Kingston passenger boat service started in 1888 and brought hundreds of thousands of visitors to the Thames Valley every year. Today you can take a Salters Bros boat trip from Mill Meadows to Reading or Marlow from the end of May to September. The Mary Stuart is one of Salter Brothers classic Edwardian steamer design boats that does these trips which was built in 1923 and acquired by Salter Brothers in 1956. The family had a great connection with rowing and Henley. In 1851 the family competed at the Henley Royal Regatta and they were the leading racing boat builders of the 1860s, which included producing the umpire boats that were used in the contest. It was started by brothers John and Stephen Salter in Oxford and is being run today by fifth and six generation family members. He was delighted that History Press wanted to publish the book last year as they are the most well-known of the historical publishers. The book is available from Amazon, all good book shops and coming soon to the River & Rowing Museum shop for £14.99. Simon works part-time at the Oxford University’s Continuing Education Department and hopes that the book will open doors to other research projects or perhaps another history book.